It is an honor for me to be here on Jeju Island and assist in the 5th Session of the Codex Task Force on Antimicrobial Resistance. First, let me thank our hosts from the Republic of Korea for their kind offer to continue their contribution to the task force and especially our chairperson Prof Park. Codex could not work without its host governments and the Codex chairs – they are the backbone of the Codex system providing almost 50% of the Codex budget through in kind contributions. Codex is all about food and about enabling safe, good quality and nutritious food to get to everybody through trade and while doing so promote fair practices in the food trade. Safety and fair practices are extremely important when dealing with complex challenges such as AMR. Going wrong on either may put lives at risk either because of the compromised food safety or by interrupting the international supply chains. It is a challenging task to give harmonized guidance to members who find themselves in different national situations. What we are dealing with here? I sometimes call it – bugs are getting smarter than drugs - to make it easier to remember. Not with a science fiction intelligent superbug but resistance created through genetic adaptations sped up by sheer numbers and possibilities given to the simple bugs which collectively makes them “smarter” and faster than our current development of new antimicrobial drugs. Resistant bacteria can send us back to the 19th century and before where many infectious diseases were untreatable. Problems related to AMR are inherently related to antimicrobial use in any environment, including human and non-human uses. Continued concerted harmonized action is needed to reduce possibilities for the bugs to develop resistance and to shield consumers from them. The international community has realized some time ago the need for action at all levels – from the political level of the General Assembly to the more technical work of FAO, WHO, OIE and Codex. There are multiple activities on AMR these days – sometimes so many that we have trouble following them. The Codex Committee on Residues of Veterinary Drugs on Food developed the Code of Practice to Minimize and Contain Antimicrobial Resistance which was adopted in 2005 and TFAMR 1-4 finalized the Guidelines for Risk Analysis of Foodborne Antimicrobial Resistance in 2011. 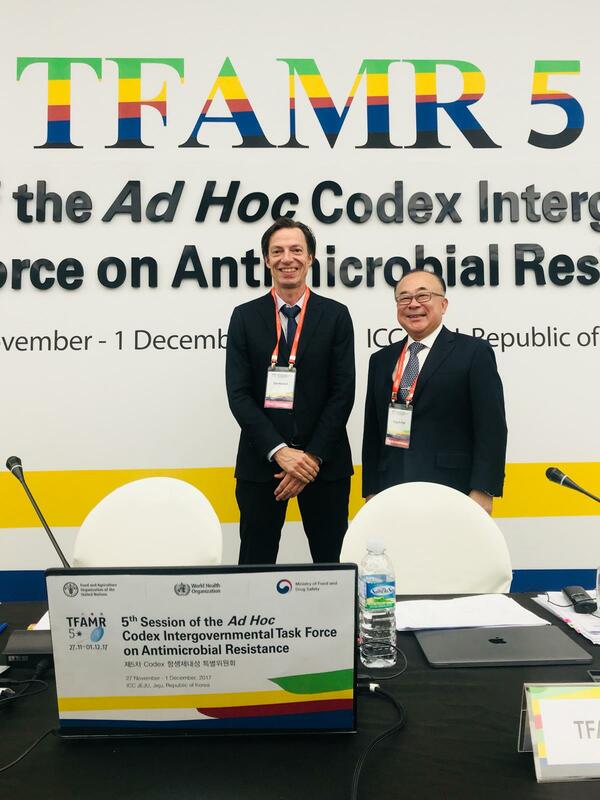 The new work of TFAMR will be to update and broaden the scope of the 2005 code based on present knowledge and science and to develop guidance on integrated surveillance. Of course, this should happen in full recognition of the mandate of Codex and considering results already achieved by others and not duplicating work. I would like to thank all the Chairs and Co-Chairs and participants of the pWG and the two EWGs that have worked in preparation of the excellent main documents that we will discuss here and wish all of us a successful and pleasant week. Clearly, we will not finish the work in one session but I hope that at the end of this meeting we all will have a much better understanding of the concerns of others and work towards consensus.